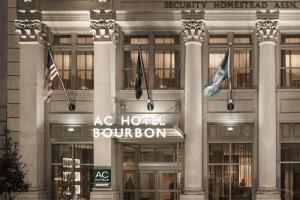 Contemporary style meets Southern charm at AC Hotel New Orleans Bourbon. With the sights and sounds of Bourbon Street and the French Quarter, just minutes away, the hotel is perfectly situated for you to discover the city's endless array of activities, festivals and attractions. Attend a game at the Mercedes-Benz Superdome or the Smoothie King Arena. After a busy day, retire for the night in a stylish room with locally inspired décor and plush bedding. The high-tech accommodations come with free Wi-Fi and flat-screen TVs offering access to your favorite streaming services.